Hi guys, I just wanted to share all the parts we've designed for various upgrades to the Kossel. I know there are a lot of similar things floating around out there, but it doesn't hurt to have more options. This is a holder for your Smoothie board, but unlike the stock Brainwave mount it is horizontal instead of vertical. This gives much easier access to the wires. Separate versions for the X5 v1 and v2/v3. This holds a 60 mm fan for cooling the Azteeg board. This is important. The Azteeg likes to get hot. Not really. The only material besides ABS with a glass transition temperature above 100 C is Polycarbonate. You might be able to get away with PET. The bed is significantly cooler around the edges, and the bed holders are seperated from the heater by silicone pads. 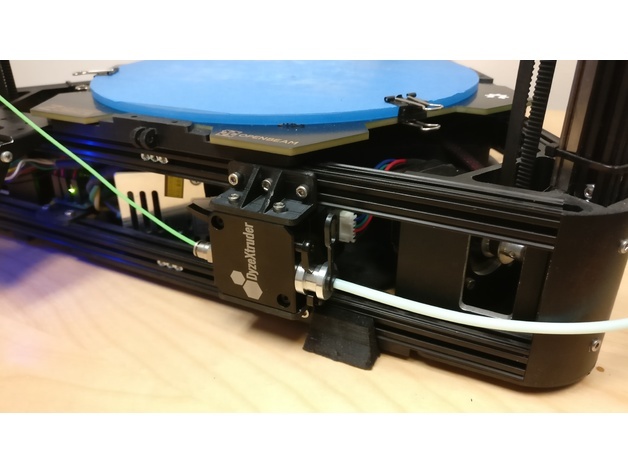 This lets you mount a DyzeXtruder GT in place of the EZStruder. The DyzeXtruder is nice because it has a locking release lever, so you don't have to hold the lever while you insert or remove filament. It also has dual pinch wheels (like the Bondtech) and is fully constrained for printing flexibles. Print two of these. One goes on top, one goes on bottom.